Wood products have countless uses in our modern world. From furniture and flooring, to children's toys and paper products, you are likely never more than an arm's reach away from something made of wood. Wood is durable, renewable, and affordable, making it an excellent material for a wide range of products. After years of research and testing, a wood-based infill emerged as the natural next step for artificial turf fields. Wood may seem like an unconventional choice for an infill material. and it is! Other organic infills have been made from cork, coconut husk, and walnut shells, but BrockFILL's innovative design makes it the first artificial turf infill derived from wood. We expected using wood as an infill material would raise some questions. Many people are concerned about splinters or chips that could harm athletes when they slide or fall. However, BrockFILL was specifically engineered using special equipment during the manufacturing process to remove long particles that could become splinters. A successive conditioning process also buffs and smooths particles into a non-abrasive infill. Splinters normally occur when contact is made with fixed, rough wood particles such as lumber. BrockFILL particles are mobile and move on contact to prevent splintering and reduce abrasion. Abrasion is one of the most common complaints from athletes who play on artificial turf fields, because an abrasive surface can cause injuries when sliding or diving. BrockFILL was designed to be less abrasive that crumb rubber or other organic infills. Independent testing from Labosport, shown above, uses a machine to mimic the velocity and weight of a sliding athlete. The machine measures the heat generated by this contact, since heat and friction are related. BrockFILL generated the lowest temperature (and therefore the lowest friction) of any tested infill. Infills that generate less friction have a lower risk of causing skin abrasions. BrockFILL also tackles another common complaint athletes have about playing on synthetic surfaces: heat. Artificial fields with crumb rubber infill can reach temperatures of 175+ degrees Fahrenheit. This is dangerous for athletes, and can cause burns, blisters, or heat exhaustion. The unique properties of wood make BrockFILL significantly cooler than crumb rubber, even without irrigation. The particles are naturally hydrophilic, so they absorb rainwater and condensation to their core. The moisture is slowly released from the particles for extended cooling. This characteristic also makes BrockFILL particles heavy enough to sink, so they won't float away in the rain. Even though BrockFILL fields will be much cooler than a crumb rubber field, mold will not grow in the infertile environment of artificial turf. Mold likes dark, wet, and static environments. An artificial turf field is the opposite. Wood's ability to resist mold is proven by the thousands of playground and park applications that rely on wood chips for shock absorption. To ensure we are creating the safest surface possible for athletes, BrockFILL complies with California Proposition 65 (Safe Drinking Water and Toxic Enforcement Act of 1986). This proposition requires businesses to inform Californians about exposure to chemicals known to cause cancer, birth defects, or other reproductive harm. None of the ingredients contained in BrockFILL are subject to reporting under this requirement. Independent testing determined BrockFILL does not contain detectable concentrations of pesticides, chlorinates acidic herbicide residues, and concentrations of heavy metals are far below screening levels for the protection of human health. Furthermore, allergies typically come from either pine pollen or pine nuts, neither or which are present in BrockFILL. During the BrockFILL manufacturing process, particles are stripped of resin and other compounds that could cause allergens or irritation. Removing resin from the wood is also beneficial because it reduces the flammability of BrockFILL. Without resin, the particles will not maintain a flame. When a flames is removed, the small particles do not generate enough heat to ignite other particles. 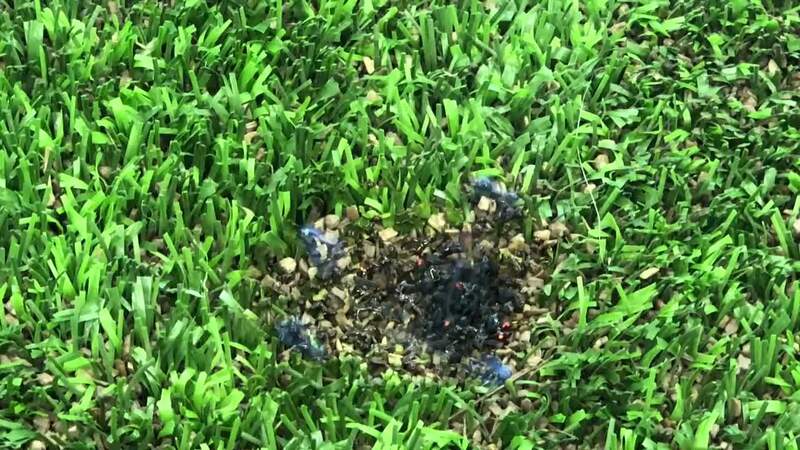 In our testing, the artificial turf fibers actually burn longer than BrockFILL particles when exposed to flames. After years of extensive research and testing, we believe wood is the best material for an artificial turf infill. The unique properties of wood make BrockFILL a safe and sustainable replacement for crumb rubber infill. Still have questions about the safety of BrockFILL? Visit out FAQ page or contact a Brock representative. Kelsey started as an Intern in 2017, and was later promoted to Social Media Specialist. She is a current student at the University of Colorado, studying Strategic Communications and Media Production. Kelsey plans social media posts, writes blog articles, and doubles as the official pet-sitter for Brock USA. In her free time, she enjoys running, playing soccer, and photography.